The biggest changes to supercars, and near supercars, has been transmission options. Cars like the Audi A8, Porsche 911, Porsche Boxster, and other Euro-sleds come with dual clutch automatics that are the fastest transmissions and also offer manual control for fun and car control via wheel mounted paddle shifters. Enthusiasts have been buying these in greater numbers than manual, stick-shift transmissions, and it is hard not to notice GM does not offer a dual clutch automatic. Other cars like the Nissan 370Z, Porsche 911, and now this new C7 Corvette Stingray, offer an innovation on the old stick-shift transmission. These cars’ manuual transmissions can automatically match revs while the driver brakes, shifts, and turns the car. This makes the car more stable in the corners, but also allows the driver to exit in the desired gear for perfect acceleration. Some enthusiasts, and all race drivers, can “heel-toe” a manual car. This is actually a misnomer, the drivers use the ball of their right foot to brake and also they turn that foot so that the side of it can blip the throttle as they down shift. Get it right and the car sings a great song and smoothly shifts down while moving through the corner. Get it wrong and you are either sideways, harming your clutch, bouncing off the rev limiter, or the car bucks because you didn’t add enough revs. The 2014 Corvette Stingray does have paddle shifters on its torque-converter (conventional) automatic transmission car. That makes sense. Most sporty cars have them now, even if they don’t have the more advanced dual clutch gearbox. 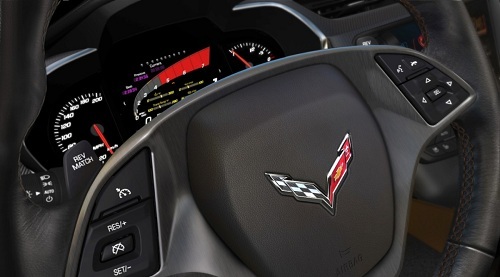 However, the Corvette also has paddle shifters on the wheel on its rev-matching, stick shift car. Why would Corvette have these? Apparently Corvette designers either thought it would be super important to be able to turn on and off the rev matching function, so they used the wheel mounted paddle shifters as the switch for the on/off. Or, the designers did the math and they realized it would cost more to have two steering column set-ups, one with, and one without the paddle shifters. You can decide which case it is, but either way, the Corvette will have paddle shifters that turn on and off a device that people will almost never turn on and off. Let's all hold hands and do the Happy Dance that the 1 to 4 skip shift is not part of this new car's stick shift, as it was for a decade. The next surprise that the 2014 Chevy Corvette Stingray has in store for buyers is carbon fiber. Not just a thin little spoiler, or some fake carbon fiber trim inside. On the base model, and presumably all more expensive trims, the Corvette will have a carbon fiber roof and also a carbon fiber hood. Carbon fiber is extremely expensive compared to other body panels such as steel or aluminum. There has never been a production car this low in price that came with so much of this exotic material. Owners may find two unexpected surprises result from the carbon fiber hood. First, if you park the Vette alongside the curb and a pickup truck tries to parallel park in front of you and bumps that hood with the trailer hitch the result is going to be a very expensive repair or replacement. Do you think the local body shop is going to be able to properly repair a carbon fiber hood. They are not. Nor can they recycle the carbon fiber. Second, insurance companies know this. Be prepared to see your insurance rates go even higher for a Corvette (is that even possible?). As amazing as it is to find a carbon fiber hood on a $55,000 Corvette, it is equally amazing that the headlights are not articulating. That means they don’t turn to show the driver the road ahead when the car turns. Cars costing much less have this feature, and in a sports car it makes the most sense. Buyers of $55K sports cars often have luxury sedans or luxury SUVs and they are the buyers who know what articulating headlights are, and they will miss them. The 2014 Chevy Corvette Stingray is the first in a while that will use smaller tires than the previous generation. The reason is mainly cost, but also because it can. The new Vette can achieve the same amazing 1 g sideways acceleration trick that its prior generation can, and do so with less rubber. We first saw the Fred Flintstone tires on the C4 series Corvette. That car was basically a race chassis and the tires made sense economically. It made the C4 move up from near sports car levels of performance to actual supercar levels of performance. Giant wheels and tires come with baggage though. They act to slow acceleration and deceleration and, as a reader commented recently, they also slow handling response. They are also very, very expensive. Anything to break the trend of the Corvette’s tires moving towards touching in the middle of the car is welcome. We left this for last, but the 2014 Corvette Stingray is one of the only cars in the world that has cam inside the engine, two valves per cylinder, and direct injection. This mix of old and new is quaint. One reason for the two valves per cylinder instead of four is space, but really it is because the Corvette breaths well enough with two. The V8 in the new C7 Vette is more compact than almost all rival’s engine. Kudos to Chevy for not moving to a smaller, turbo engine to save money. The 2014 Corvette Stingray has other notable features, but these five are the biggest surprises to those that follow the longest continuously running nameplate in the sports car world. What surprised you about the new Corvette Stingray? Comment below. The tail lights look like a twin brother to the Camaro. I believe in moving forward and staying modern, but there's still something to be said for long standing tradition. Disappointed. But, with the chasis upgrades, the stance and overall cosmetic design, it is one of the best looking Corvettes ever. In fact, the only complaint I have, is in the new shaping of the tails. Not a game breaker, but I may look closer at the C6 Grand Sport for my next one as opposed to going for the C7. Big Kev, You nailed it. In fact, the Corvette's chief engineer, Tadge Juechter, was quoted by Automobile Mag as saying "These are our pop-up headlights." He was referring to the controversy about the Vette moving away from pop-ups, to fixed headlamps in the last generation. Chevy knew the new tail-lights would be seen as Camaro-like. Bear in mind that when this Corvette Stingray arrives on dealer lots the Camaro ZL-1 will have about 130 more horsepower, and is arguably the company's fastest sports car. For sure these rear lights would be the Corvette Stingray's "6th most shocking feature." Thanks for reading and commenting. I believe this is the first Corvette that does not have round tail lights. Before any responses, the 58 had around tail light with a long lens. Should have a round tail light, in my opinion, the C-6 had to grow on me. Thanks Dr. D. To me round tail-lights are a Chevy thing. To my eye (born in late sixties) the 1970-72 Camaro round tail-lights are about the best design a car has had. At least they don't move, flash like strobes, or create an arrow on the new Corvette! As far as I know. Haven't actually seen them in action yet.